These are TRULY the times that try men’s souls. It it not hard to see and understand that we are faces the same tyranny that our forefathers faced over two and a quarter centuries ago. And unless we revert back to their ideology, their attitude, and their willingness to act BEFORE it is to late, then unlike them, we will crumble! We will succumb entirely to the tyranny of these evil administrators, these powers in high places. Unless American’s who still believe in the BASIS for which we were founded stand up now and demand accountability of our “leaders” and restoration of the founding principles of the Greatest Nation the world has ever known, then we will cease as a Nation built upon the Liberty of the Human Soul. Below is the full text of one of the greatest speeches by one of the greatest men to stand up for Colonists, forge an attitude that “enough is enough”, and helped to cement a people, “We the People” into a Nation. The Crown of England is no longer the opposition. The Crown of this tyrannical, over-sized, wild and unchecked United States Government IS the travesty eating away at the soul of a Nation. The liberal notion that traditional value must be banned and outlawed so that “alternative” ideologies might be exalted is devastating this Country that we love, and this Constitution that we defend. ‘Tis surprising to see how rapidly a panic will sometimes run through a country. All nations and ages have been subject to them. Britain has trembled like an ague at the report of a French fleet of flat-bottomed boats; and in the fourteenth [fifteenth] century the whole English army, after ravaging the kingdom of France, was driven back like men petrified with fear; and this brave exploit was performed by a few broken forces collected and headed by a woman, Joan of Arc. Would that heaven might inspire some Jersey maid to spirit up her countrymen, and save her fair fellow sufferers from ravage and ravishment! Yet panics, in some cases, have their uses; they produce as much good as hurt. Their duration is always short; the mind soon grows through them, and acquires a firmer habit than before. But their peculiar advantage is, that they are the touchstones of sincerity and hypocrisy, and bring things and men to light, which might otherwise have lain forever undiscovered. In fact, they have the same effect on secret traitors, which an imaginary apparition would have upon a private murderer. They sift out the hidden thoughts of man, and hold them up in public to the world. Many a disguised Tory has lately shown his head, that shall penitentially solemnize with curses the day on which Howe arrived upon the Delaware. As I was with the troops at Fort Lee, and marched with them to the edge of Pennsylvania, I am well acquainted with many circumstances, which those who live at a distance know but little or nothing of. Our situation there was exceedingly cramped, the place being a narrow neck of land between the North River and the Hackensack. Our force was inconsiderable, being not one-fourth so great as Howe could bring against us. We had no army at hand to have relieved the garrison, had we shut ourselves up and stood on our defence. Our ammunition, light artillery, and the best part of our stores, had been removed, on the apprehension that Howe would endeavor to penetrate the Jerseys, in which case Fort Lee could be of no use to us; for it must occur to every thinking man, whether in the army or not, that these kind of field forts are only for temporary purposes, and last in use no longer than the enemy directs his force against the particular object which such forts are raised to defend. Such was our situation and condition at Fort Lee on the morning of the 20th of November, when an officer arrived with information that the enemy with 200 boats had landed about seven miles above; Major General [Nathaniel] Green, who commanded the garrison, immediately ordered them under arms, and sent express to General Washington at the town of Hackensack, distant by the way of the ferry = six miles. Our first object was to secure the bridge over the Hackensack, which laid up the river between the enemy and us, about six miles from us, and three from them. General Washington arrived in about three-quarters of an hour, and marched at the head of the troops towards the bridge, which place I expected we should have a brush for; however, they did not choose to dispute it with us, and the greatest part of our troops went over the bridge, the rest over the ferry, except some which passed at a mill on a small creek, between the bridge and the ferry, and made their way through some marshy grounds up to the town of Hackensack, and there passed the river. We brought off as much baggage as the wagons could contain, the rest was lost. The simple object was to bring off the garrison, and march them on till they could be strengthened by the Jersey or Pennsylvania militia, so as to be enabled to make a stand. We staid four days at Newark, collected our out-posts with some of the Jersey militia, and marched out twice to meet the enemy, on being informed that they were advancing, though our numbers were greatly inferior to theirs. Howe, in my little opinion, committed a great error in generalship in not throwing a body of forces off from Staten Island through Amboy, by which means he might have seized all our stores at Brunswick, and intercepted our march into Pennsylvania; but if we believe the power of hell to be limited, we must likewise believe that their agents are under some providential control. Quitting this class of men, I turn with the warm ardor of a friend to those who have nobly stood, and are yet determined to stand the matter out: I call not upon a few, but upon all: not on this state or that state, but on every state: up and help us; lay your shoulders to the wheel; better have too much force than too little, when so great an object is at stake. Let it be told to the future world, that in the depth of winter, when nothing but hope and virtue could survive, that the city and the country, alarmed at one common danger, came forth to meet and to repulse it. Say not that thousands are gone, turn out your tens of thousands; throw not the burden of the day upon Providence, but “show your faith by your works,” that God may bless you. It matters not where you live, or what rank of life you hold, the evil or the blessing will reach you all. The far and the near, the home counties and the back, the rich and the poor, will suffer or rejoice alike. The heart that feels not now is dead; the blood of his children will curse his cowardice, who shrinks back at a time when a little might have saved the whole, and made them happy. I love the man that can smile in trouble, that can gather strength from distress, and grow brave by reflection. ‘Tis the business of little minds to shrink; but he whose heart is firm, and whose conscience approves his conduct, will pursue his principles unto death. My own line of reasoning is to myself as straight and clear as a ray of light. Not all the treasures of the world, so far as I believe, could have induced me to support an offensive war, for I think it murder; but if a thief breaks into my house, burns and destroys my property, and kills or threatens to kill me, or those that are in it, and to “bind me in all cases whatsoever” to his absolute will, am I to suffer it? What signifies it to me, whether he who does it is a king or a common man; my countryman or not my countryman; whether it be done by an individual villain, or an army of them? If we reason to the root of things we shall find no difference; neither can any just cause be assigned why we should punish in the one case and pardon in the other. Let them call me rebel and welcome, I feel no concern from it; but I should suffer the misery of devils, were I to make a whore of my soul by swearing allegiance to one whose character is that of a sottish, stupid, stubborn, worthless, brutish man. I conceive likewise a horrid idea in receiving mercy from a being, who at the last day shall be shrieking to the rocks and mountains to cover him, and fleeing with terror from the orphan, the widow, and the slain of America. CALL upon ALL freedom loving Americans to JOIN US in this honorable endeavor. 1) We are an organization of professionals who at all times act in a professional manner. 2) We call for peaceful actions, with the law and the constitution on our side. 3) We DO NOT need or desire violent actions and will NOT sanction any form of violence. 4) We never ask if, but how. 5) We always intend to finish what we start. 6) We want to have our say, but will defend the right of others, to have their say as well. 7) We will resist all efforts to escalate a situation to violence. 8) We will watch out for each other, and de-escalate a situation before it becomes violent. 9) We will not stoop to the ill behaviors of others. We will stay on the high ground. 10) We will use only minimal force to end a confrontation when all else has failed. 11) We will speak clearly, concisely and factually at all times. 12) We will clean up after ourselves when gathering in public places. 13) We will self-police our behaviors and that of our fellow patriots at all times. 14) We will be part of the solution, never part of the problem. 15) A right to self-defense is essential to liberty. But we will not initiate violence. It is not our intention to make war with our Government, but rather to expose and evict the tyrants whom we have allowed to take power away from the people and we stood idley by and did nothing. Although we have maintained a good conscience and have spoken out against this tyranny, we have quite literally done nothing! We have been told that we are governed by democracy, and not by the Republic upon which we were founded. And this is one of many fallacies we have fallen prey! A democratic people did NOT found this nation! It was a mere THREE (3) percent that initially stood up against the crown! And the Spirit of THAT 3% is what we are calling on today! We have allowed Congresses and Presidents to slowly and methodically inhibit, restrict, and in many cases completely remove our valuable and preserved, inhereted rights! And for this, we now reclaim those rights as our own, and we STAND AGAINST ANY AND ALL “LAWS” THAT PROHIBIT US FROM THESE RIGHTS”! We wish not for war, we do no’t envy violence, we pray that our voices be heard and changes be made WITHOUT a single shot fired! And we will NOT be held responsible if we must defend ourselves. But know this, we WILL defend ourselves! We will march in our Nations Capital bearing EVERY RIGHT OUR CONSTITUTION AND BILL OF RIGHTS AFFORDS US! Make no mistake, THEY WILL TRY TO STOP US! They will confront us with police action, they will pervert our actions and motives through the media, they will facilitate lies and false claims in order to defamate us personally and as a group! But we will push on! We will Stand Strong and Perservere! On December 16, 2011, in honor of the 238 year anniversary of the Boston Tea Party, we will march on Washington! 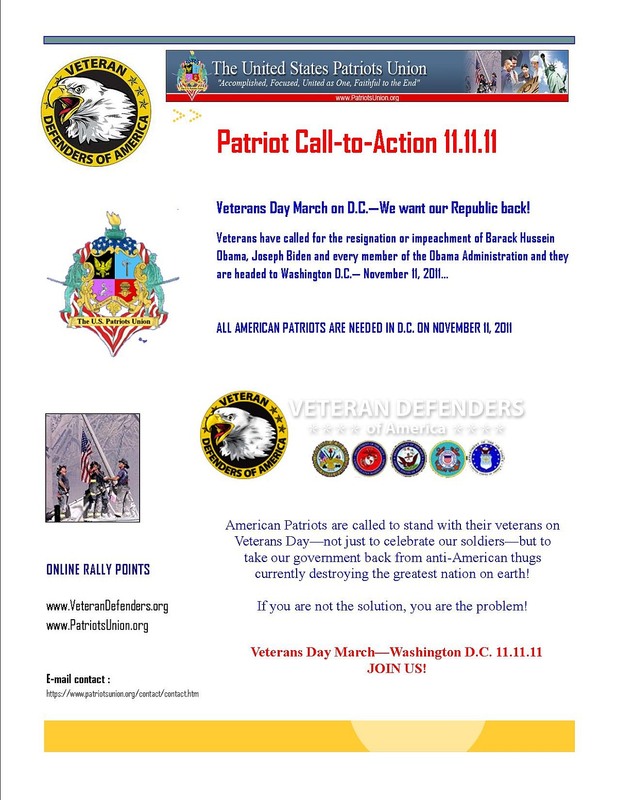 We do not intend to “occupy” our nation’s Capital, only to demand that their “mob rule” ceases, our voices be heard, and FULL restoration of the United States Constitution and The Bill of Rights becomes effective immediately! But LET IT BE KNOWN! WE WILL DEFEND OURSELVES! We call on citizens to march with us, armed with the United States Constitution and Bill of Rights AND ALL OF THE PROVISIONS IT PROVIDES, utilizing YOUR rights therein for the duration or for just a day! We call on doctors, nurses, and EMT’s to march with us to tend to the sick and/or injured! We call on CONSTITUTIONAL Politicians to march with us! Speak up for these Patriots who are willing to Stand Up for our Constitution! We call on the OathKeepers,the III percenters, Sons of Liberty, Daughters of the Revolution, AND ALL THOSE WHO STAND UP FOR this Great Republic to March with us! WE desire that ALL OF THOSE IN THE NATIONAL ARENA STAND UP! WE do not Pledge Allegiance to a man, or men! WE PLEDGE OUR ALLEGIANCE TO THE FLAG. THE CONSTITUTION, THE BILL OF RIGHTS, AND THE SPIRIT OF THOSE WHO FOUGHT SO HARD TO SECURE ALL OF THIS FOR US!!!! RISE UP AND MARCH WITH US! 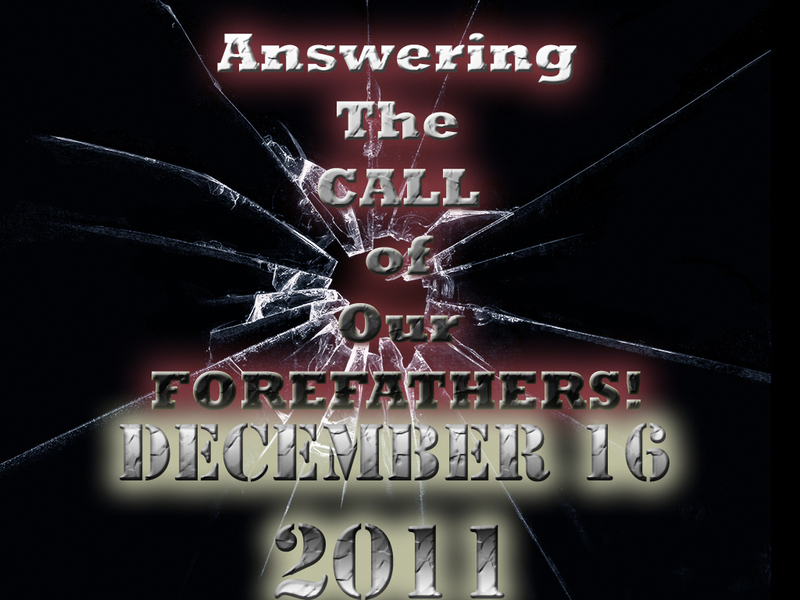 It begins December 16, 2011! It ends when the TYRANTS have renounced themselves from OUR CAPITAL!